Usage: When mounted to the motherboard, the ALICE frame is what the straps connect to so the user is able to wear their pack comfortably by offering excellent weight distribution and adjustability. A common misconception is that these frames come in different sizes when in fact it is only the attached bags sometimes included that change in size. 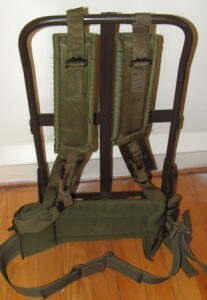 ALICE pack frames can usually be found for around $20-$40 dollars on websites such as eBay and also in local military surplus stores. The ALICE Frames come in two forms, the LC-1 and LC-2. note: the straps are not consistent. some LC-1 straps are unpadded some aren't. The LC-1 has a smaller Kidney Pad along with a crisscross kind of connection from Strap to Frame. The waist strap quick release has a cover and is smaller in size. 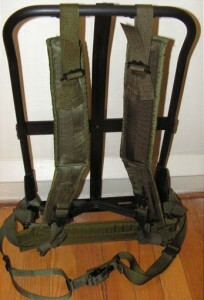 The LC-1 Frame itself comes in black, and the straps are Olive Drab. Also, a crucial detail in the LC-1 Frame is the horizontal crossbar, which is flush with the frame. It's harder to find now a days due to lesser usage and lesser comfort. However, it is most essential to have an original black LC-1 frame if you're making an 100% accurate GB1 Proton Pack. According to research made by RedDeath, here's the national stock number (NSN) of all the required components of the LC-1 frame assembly. The LC-2 has a larger Kidney Pad and bigger straps along with a straight connection from Strap to Frame. The waist strap can either have a small plastic quick release, or a large V-clip. The LC-2 frame is only available in Olive Drab, which means you will have to paint it. The correct frame used is green annodized. Also, the horizontal crossbar on the LC-2 has a 1" offset off the frame, making it harder to mount on the Motherboard with spacers. However, the LC-2 is much easier to find than the LC-1 due to it's newer age and comfort compared to the old LC-1's. You will need a Black LC-2 if you plan on making a 100% accurate GB2 Proton pack.